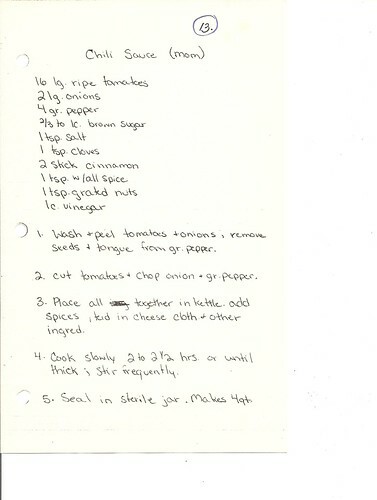 This is the third in a series of recipes shared by my grandmother Joanie. 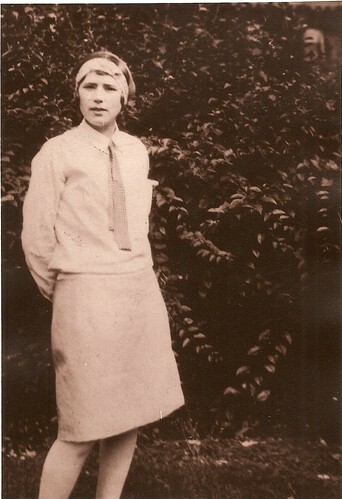 My great-grandmother (my grandfather’s mom) was known as Muzzy. Her full name was Orpha Marie Campbell Wilder, and I think her peers knew her as Marie. But when she had her first grandkids, they struggled with saying “Grandmother” — and thus “Muzzy” became her name. Today, I’m sharing her chili sauce recipe, a relish-like blend of spices and veggies that will make your kitchen fragrant and your meals flavored with Midwestern comfort. The photo above is Muzzy as a young woman. Look at her, rocking the skinny tie with a skirt! “She was a hell of a go-getter,” Joanie said about Muzzy. “She came up (to Ohio) when she was 15, from Kentucky. She started working in a factory. “She met CO (Clyde Oscar, her husband) when she was young. He was three or four years older. They got married, and he was the manager of a used car lot, and he also worked on Pullman trains. She worked their whole married life. There are certain things I remember clearly about Muzzy: her sourdough bread, smothered in butter and jelly. Little jars of candy in her house. Homemade afghans. She died when I was in high school, but I have nothing but good memories of her when I was a child. She had lots of grandchildren and great-grandchildren, and I always felt loved, well-fed and part of a big, wonderful family in her home. A few notes about the recipe below: I halved it from what’s written, because I didn’t think I needed 4 quarts of spaghetti sauce. However, I’m including the full version here, in case you really love this stuff. The half-recipe made enough to use some for ground-beef chili (1 lb. ground beef), as well as a batch of lentils later in the week (probably about 2/3 cup dry lentils). Finally, a comment on serving/use: The spices in this are similar to “Cincinnati chili,” which means it will seem pretty unusual to non-Ohioans. 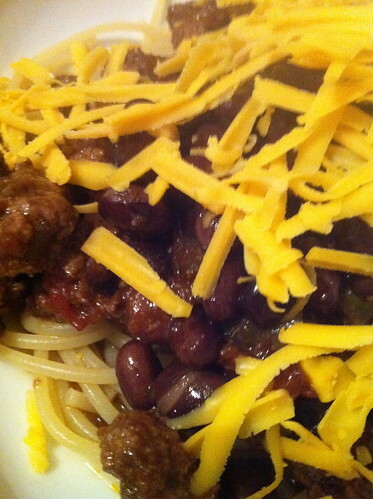 I used about two cups of the sauce mixed into cooked ground beef, then served that on top of spaghetti, topped with black beans, cheese and oyster crackers. A few days later, I used another cup or two cooked with cooked lentils. Both versions were home-y, warm comfort food. Wash and peel tomatoes and onions, remove seeds and tongue from green pepper. Cut tomatoes and chop onion and green pepper. Place all together in kettle, add spices tied in cheese cloth and other ingredients. Cook slowly 2 to 2-and-a-1/2 hours or until thick; stir frequently. Seal in sterile jar. Makes 4 quarts. *The smell of the vinegar, cooked with the spices, led to the Hubbs walking into the apartment and declaring, “It smells like pickles in here!” But don’t let that deter you. When are you coming to Florida? Last week in February or any of March looks good. This note entitles you to free air fare, dinner at great seafood restaurants and sunny beaches.